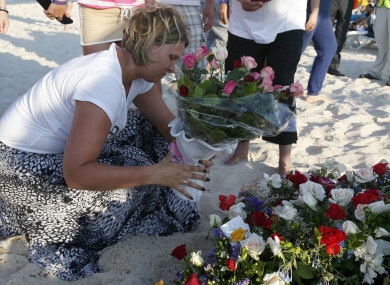 THE HUSBAND OF a woman shot dead by a terrorist while on holiday in Tunisia found her dead beneath her beach towel. Declan Carty went looking for his wife after a gunman went on a killing spree that claimed 38 lives. Three Irish people were killed in the attack, Carty’s wife Lorna (54) and Laurence (56) and Martina Hayes (55) from Athlone, Co Westmeath. “I went to the beach, I lifted a towel. It was Lorna… She was lying with her head to one side as if she was lying in the sun,” Carty said. Dublin Coroner’s Court heard harrowing evidence from tourists staying at the Imperial Marhaba Hotel at Port El Kantaoui in Sousse, Tunisia where the attack took place shortly after noon on 26 June 2015. Carty and his wife had moved there from another hotel due to construction work. “There was banging and clattering. Lorna explained that I’d had a heart attack and I was on holiday to rest,” he said. The couple, from Balbradagh, Robinstown, Co Meath were “delighted” with the new hotel. The holiday had been paid for my Carty’s brother. “It was a fine hotel, quiet. We were enjoying our holiday. We met another Irish couple, the Hayes,” he said. On the morning of the attack, Carty was in the hotel room and his wife was at the beach. The couple’s bags were packed, they were due to leave that day. I woke up to what I first thought was fireworks. It sounded like a machine gun. I looked out but everything looked normal, there was a jet-ski and a paraglider moving in the water. When Carty saw people running and screaming along the beach, he tried to phone his wife but got no answer. “She turned white. She was pointing at the key in my hand, she’d no English. There were other guests there and we ran to my room and stayed there for the duration. There was glass crashing, I could hear a bullet ricocheting. There was shooting and it went on for a while. “I thought we were going to die on the day. I just didn’t know what was going to happen,” Carty said. After the attack, he went looking for his wife. “She was a nurse, so I knew if Lorna was able to move at all she’d be looking for me. I knew there was something wrong. I headed for the beach,” he said. Before he found his wife, he lifted a beach towel placed over a body and recognised the face of Martina Hayes. Giving evidence, Sinead Hayes (33), the only child of Martina and Laurence Hayes, from Westlodge, Athlone, Co Westmeath said the couple went on holiday to mark their wedding anniversary. “They were due to fly back into Dublin at midnight on 26 June, a Friday. Unfortunately they never got to fly back,” she said. Gunman Seifeddine Rezgui had disguised his Kalashnikov rifle under a parasol as he walked 700m from a parked van onto the beach where he opened fire. The three Irish were among the first of his 38 victims. The inquest heard the Islamic State gunman specifically targeted tourists during the 30 minute attack before he was gunned down by Tunisian authorities. Witness Raymond Hegarty and his family ran from the pool area as the gunman approached behind them. “I remember hearing the whizz of bullets and the thud of them hitting something,” he said. The family barricaded themselves into their hotel room and stayed quiet. Rachel Godber and her husband were due to check out on 26 June. She hid her children in the step well of a desk in an office near the hotel lobby. “There was panic in the room. It was crowded. I could hear gunfire and explosions. At one stage there was banging on the door,” she said. The jury returned a verdicts of unlawful killing for all three deaths and recommended that a link to a Department of Foreign Affairs smartphone App alerting tourists to risks associated with travel abroad be permanently displayed on all travel websites and form an integral part of all travel bookings from now on. In a statement after the inquest, the Carty and Hayes families said no words could express their pain. “We are all still devastated by the tremendous loss we have endured. We hope that no family ever has to ensure the pain and tragic loss we have suffered,” they said. We thank all of those who have been here for us over the last 32 months and who have provided support and comfort to us, they have brought us some solace during this difficult time. Email “Husband of Irish woman shot dead while on holiday in Tunisia found her beneath a beach towel”. Feedback on “Husband of Irish woman shot dead while on holiday in Tunisia found her beneath a beach towel”.